Without doubt Antony Kalugin is a prolific, if not a relatively unknown, composer of progressive rock. Hailing from the Ukraine, this multi-instrumentalist disguised as an architect has composed and performed under several monikers including his own name, Hoggwash (The Last Horizon), and lately Sunchild with two releases 'The Gnomon' and currently 'The Invisible Line.' Until the latter crossed my review desk, I had never heard of Kalugin. Now having listened to 'The Invisible Line,' I wish I had his back catalogue because Kalugin is masterful at imaginative, intriguing and highly entertaining progressive rock. As Sunchild, Kalugin and his players bring rich compositions diverse in mood, tempo, and instrumental depth. Though piano and synthesizer driven throughout, 'The Invisible Line' boasts the use of oboe, saxophone, trumpet, flugel horn and bandura (traditional Ukrainian instrument) among other items along side more conventional tools of electric guitar and fretless bass. Even better is the fact that the more unique instruments are used in concert and not as novelties, as is often common in prog rock, in the arrangements. 'Time & The Tide' and 'The Invisible Line (Part 1)' are representative and compelling examples of this. Overall, the breadth and depth of Kalugin's compositions are immense and require repeated listening to truly enjoy; there is much to enjoy, so this is not a one off thing. 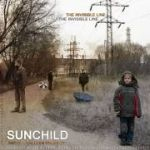 Antony Kalugin's Sunchild project 'The Invisible Line' is a rich and deeply satisfying work of progressive rock. This is not your common prog fare as Kalugin combines diverse arrangements with a multitude of uncommon instruments, like oboe and flugel horn, with standard ones to develop his arrangements both imaginative and compelling. Very recommended!